When you connect a tool to your Salesforce account, you probably want to be able to map custom fields into Salesforce! That way, you can maintain existing structures and workflows built around Salesforce. 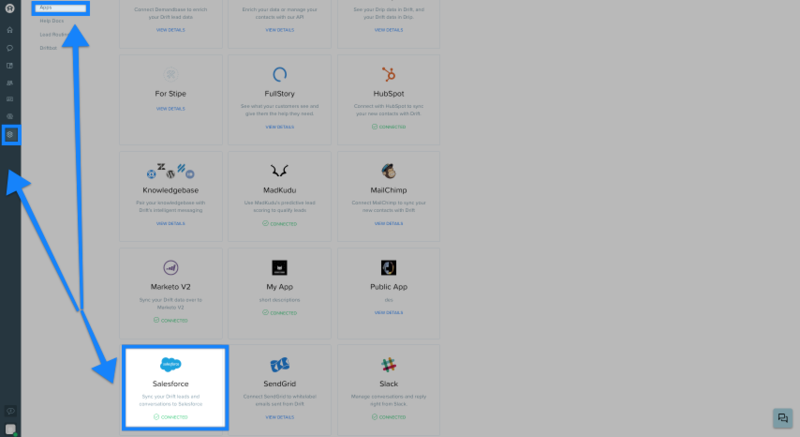 We know that Salesforce is highly customizable for each company, so we wanted to make sure that Drift can fit seamlessly into your Salesforce workflow by allowing the default fields that you map in Salesforce available in Drift! Data like UTM information, IP address, time zone, city, state, etc. that you can pick up in a conversation itself can now be mapped in your Salesforce integration! You can manually add and map SFDC attributes, or use a CSV upload! Click on Settings, and go to your Apps page. Search or scroll down to find the Salesforce Integration. Select the Mapped Salesforce Attributes option. Here is where you can setup the attribute mapping. Mapping is rather intuitive. 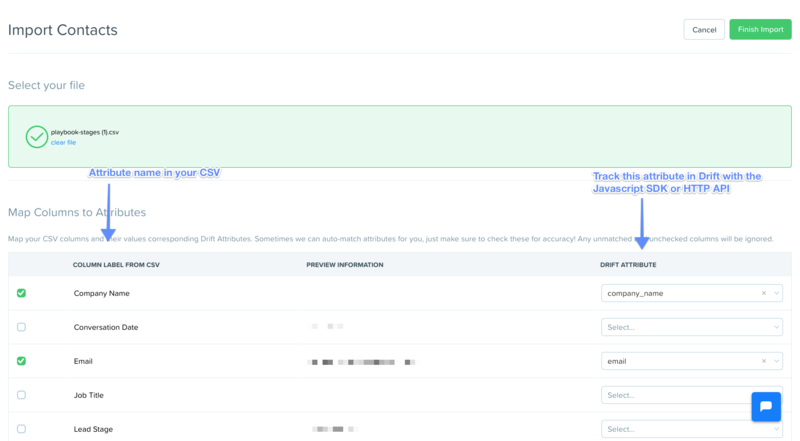 As we fill attributes in Drift, we can push them over to fields in Salesforce. In the picture below, whatever value we have for firstName will be entered into the Salesforce field First Name. You'll notice different field types (String, Boolean, Date, etc), be sure to match the correct field type! This example also includes a Static Value, Drift, to populate the Lead Source field in Salesforce. Simply begin typing into a box on the Drift side to create a static value! When you're done a dding your field, make sure you click the green "Update Mappings" button! If you are just getting started with Drift, you can upload a CSV of contacts that are assigned a certain attribute in the CSV. If you are already a Drift user and are looking to add custom attributes to your workflow now, you can skip this section! You can always customize the Drift Attribute too! Make sure to finish your import after you're done! Sending over attributes to Salesforce is usually simple, but sometimes things can get finicky. For example, Drift sends the word format of Country and State attributes. We've seen this cause errors if Salesforce is expecting abbreviations. Now, you can tell Drift to always send the abbreviated format! As you map the attributes Drift syncs to Salesforce, you might want to clarify which side is the source of truth. If the attribute on a lead/contact already exists - do we overwrite it or keep it the same? In the Mapped Salesforce Attributes section of the Salesforce settings, we now have a toggle to customize how Drift handles this!